Ice fisherman Gabe Pallen shows off his catch of the day. The view from an ice fishing shanty. Fisherman at Boxhorn Lake in Muskego, Wis.
A grandpa and his grandson ice fish. Part of what attracts people to the sport includes the lower cost of entry — it costs only $20 for an annual fishing license, and equipment such as augers and fishing poles have gone down, too. 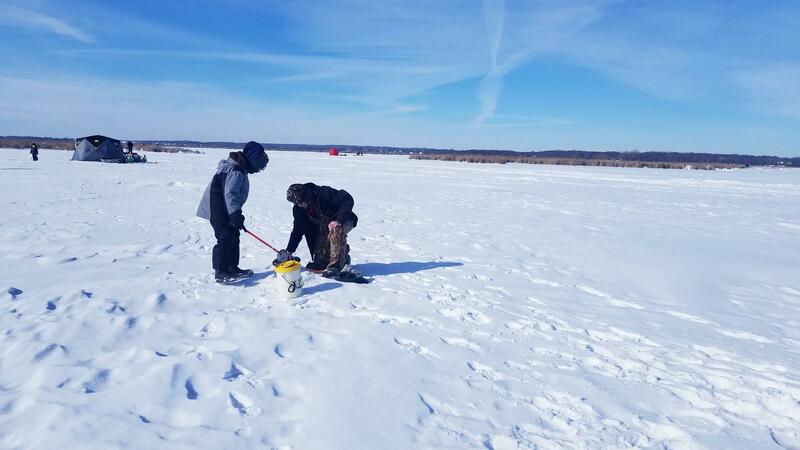 Older ice anglers also enjoy sharing their knowledge with younger Wisconsinites, keeping the family tradition alive. But what Wisconsin's anglers say they love the most about this sport is embracing, not resisting, Wisconsin's winter. Through pup tents, heating systems, and homemade shanties, they can withstand even the bitterest cold for hours. Brooks Niedziejko has always loved fishing for carp and there’s plenty to fish. A number of Wisconsin’s 15,000 lakes are challenged by the prolific reproducer. Common carp are not native, but have been swimming here for years. Europeans prized carp as a game fish, so they brought it along when settling in America. Inland fishing season opens Saturday. Thirty years ago, Eagle Lake would not have been a popular angler destination. The rural Racine County lake was dominated by common carp. The fish is not native to North American waters, but has been around a long time. Wisconsin's Lake Winnebago is home to what’s considered to be one of the largest, self-sustaining lake sturgeon populations in the world. The state's largest inland lake stretches from Fond du Lac up to Menasha and its abundance of sturgeon is a wildlife management success story. Last century, over-harvesting and poaching nearly did the species in, including in Lake Winnebago. In fact, Wisconsin banned sturgeon spearing from 1915 until 1931. Gradually the numbers stabilized and flourished.